This salad is one of my favorites. What I love about it most (besides it’s flavor) is that it can be made in advanced and served cold. It’s especially good to serve for a backyard party or BBQ when you don’t want a mayonnaise based pasta salad sitting out in the hot summer heat. This salad holds up to everything you can throw at it (or in it) and is always a popular item on the buffet table. -In a large pot, prepare the pasta according to the package directions (in salted water) and drain. -Return the drained, hot pasta back into the cooking pot. -In a microwave safe dish, on medium power, heat the olive oil, garlic, lemon zest and honey until warm but not boiling. Allow the oil to sit for a few minutes to infuse all the flavors. 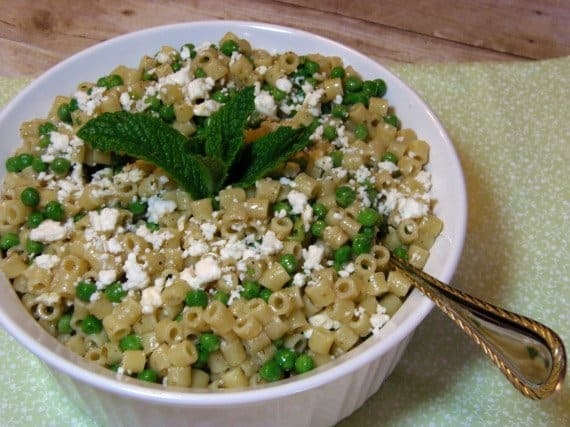 -Add the frozen peas into the cooked pasta along with the oregano, feta and lemon juice. -Season with the salt and pepper. -Add the warmed olive oil mixture into the pasta and stir gently to combine. -Right before serving, add the chopped fresh mint and stir well to combine. 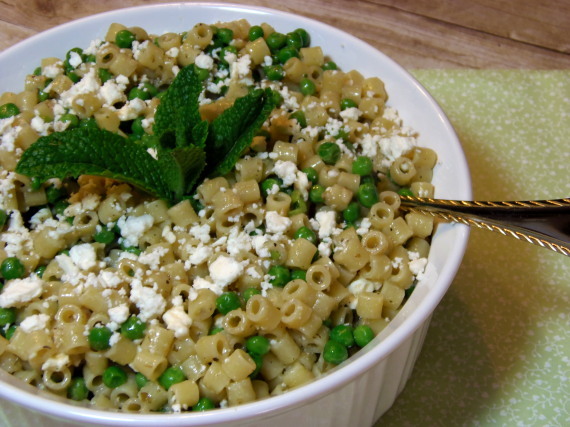 *Note – This pasta salad also tastes fantastic warm and can be reheated in a microwave before serving. It’s important to let the flavors meld and marry so refrigerating it in advance of serving is very important. Also, if you care to make this more of an entree and not just a side, add in some cooked shrimp and bump up the preparation time slightly to allow for a quick saute of the shrimp (or maybe even add in some canned tuna, if you’re a fan). Dig in. I think you’re going to love this one!! !